I love working with cultured freshwater pearls. I especially enjoy using naturally colored pearls in white, cream, peach and lavender. I often pair pearls with crystal, gemstones, coral, metal and glass beads. Unless I have a custom request that I need to find specific materials for, I enjoy picking up what "speaks to me" when I go to market. I find that something else that I already have or will trip across shortly will be a perfect fit for it. An example of this is the pearl n red coral necklace (shown at the top). The carved red coral beads caught my eye early in the day so I picked out three that went well together. Later that day, I found a strand of very white and well matched pearls and a strand of nice coral branch pieces. I later picked matching pieces from the strand of coral branches and along with the white pearls, the carved coral beads and sterling silver findings, I designed a necklace and earring set. 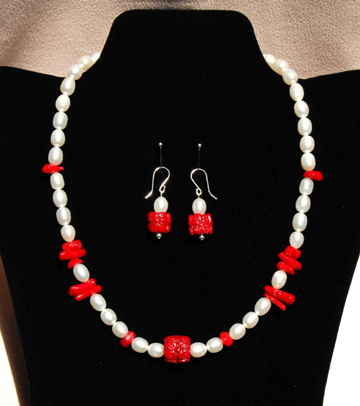 I love the contrast between the bright white pearls and the vivid red coral beads and branch pieces. 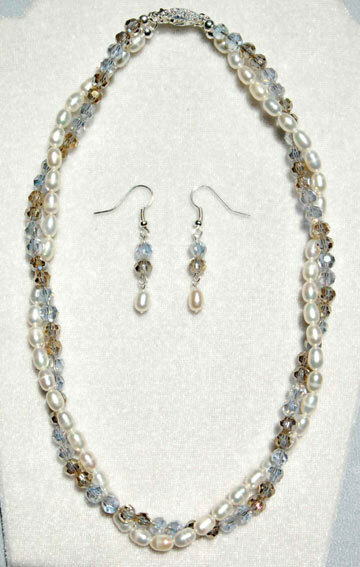 The subtle shades of the strand of pearls that I used in this twisted pearl and crystal necklace and earring set complemented two strands of crystals that I had in my stock of materials. I beaded up the strand of pearls taking care to match the colors of the pearls that would be opposite each other in the necklace as well as a strand of the crystal beads with a repeating pattern of the two colors. I combined these strands with a twist and made a matching pair of jointed, dangle earrings using the same materials. 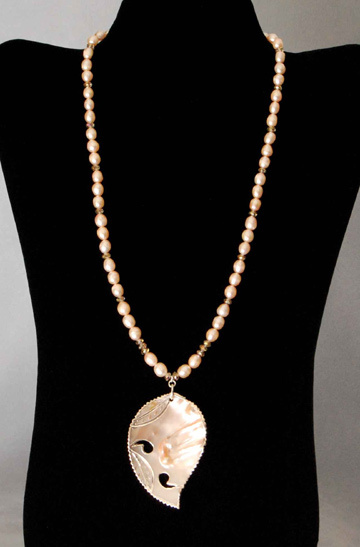 The pendant drop of the peach pearl necklace lay waiting for the right materials to go with it for over a year. I eventually found a strand of naturally colored peach freshwater pearls that picked up the peachy tones in the blister pearl pendant perfectly. I interspersed crystal beads between the pearls to finish off this elegant necklace. Ador perlele ......imi plac colierele !!!!!!!!!!! I especially like the twisted pearl and crystal necklace and earring set. It must have been tricky to get the colored pearls to line up so perfectly with complementary crystals. Thanks for sharing Cathy's work, Cyndi. lovely Cathy! thanks for sharing! Thanks everyone. And yes Eileen the design time spent to lay everything out and achieve the effect I'm going for can be time consuming but I think it is worth it.